Hello! Xin Chào! So, here we are on our adventure. The goals were to seek out opportunities to volunteer in other countries in order to sink into the culture rather than just tour it, to be a helpful part of the areas we find ourselves in, to “reset” as individuals and as a family and to travel cheaply. Also, the hope as we experience other cultures in the world together that we would grow as a family. In only two weeks we have touched on all of these goals and more. What is exciting is that we have barely started and I know we have only scratched the surface of what God has in store for us. It has been clear from the beginning that God has placed us in the right living situation when it comes to other volunteers (from everywhere imaginable) that we have become fast friends with. We have met some quality people that have spoken into all of our lives. Their experience here before us has been invaluable. 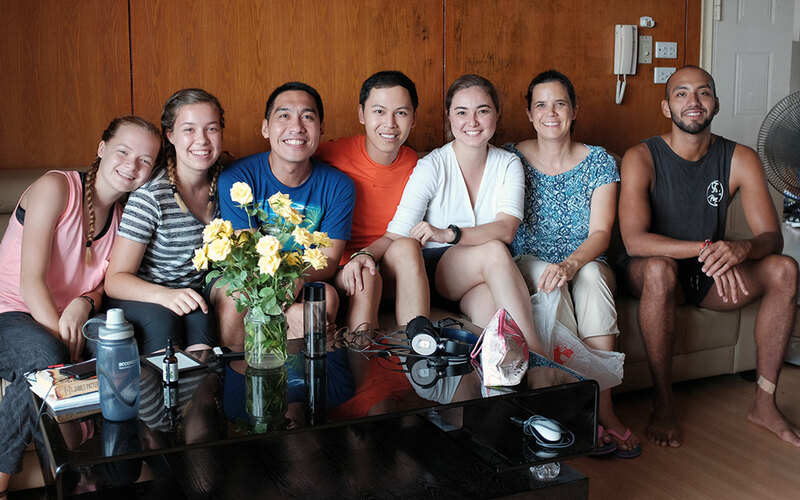 They have helped us with learning a bit of Vietnamese, finding good coffee, showing us a workout facility down the road, much food advice and getting around this crazy city. They truly have made our transition so much smoother than it would have been without them and have added a richness that I didn’t expect. It truly feels like home when we arrive back at our apartment. The Vietnamese students bring us much joy and a sense of fulfillment. As Jason stated, I always head to class nervous and honestly with a little dread, but return with a light heart, a smile and a sense of accomplishment. These students are so eager to learn and enthusiastically listen and participate. We are mostly teaching university-aged students. In general, I find Vietnamese students to be quite thoughtful and very interested in the deeper thinking topics that we are encouraged to discuss in our classes. The lesson plans are designed for the basics as well as discussions and debates on social issues and personal interests. It is both refreshing and hopeful. But don’t be fooled by my optimism. The city of Hanoi is bonkers! The traffic is deranged and unpredictable. The honking is incessant. It is hot, sticky and full of smog. Things are messy, unkept and chaotic. Unlike Jason I am not teaching in our apartment building, which at first was terrifying to me! I have to take a city bus about a half an hour to reach my classroom. Every street looks the same, very few people speak English, we drive inches away from other cars ignoring stop lights and lane lines, pedestrians walk right through it all…it is truly mad. The urgency that you must have to get on and off the bus is nerve-wracking to say the least—drivers DO NOT wait for you to be off the bus before they start moving again! However, doing this traveling has turned out to be the best thing for me—to get out, to be brave and independent in this unknown, unpredictable, insane city. The truth is, every day and every hour is different. It is helpful to remember that there is a time for everything, and a season for every activity under the heavens and God is with us through it all. Sometimes the smog is all I see, the filth is all I notice and every interaction is confusing and unfruitful. AND THEN, through the noise, I have a beautiful conversation or an amazing cup of coffee, I run into a dance lesson in the streets, or they close down a street for the night market. The most refreshing time so far came this weekend when we visited Ninh Bình and floated down the Sông Đáy river. It was a breath of fresh air in many more ways than one.